To find questions from 1 to 3, please visit the page "VOLUME OF 3D SHAPES EXAMPLES". 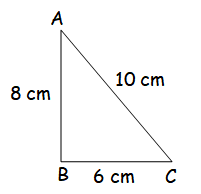 A right angled triangle whose sides are 6 cm, 8 cm and 10 cm is revolved about the sides containing the right angle in two ways. Find the difference in volumes of the two solids so formed. Now let us see the solution of the next problem on "Volume of 3D Shapes Questions with Answers". The volumes of two cones of same base radius are 3600 cm3 and 5040 cm3. Find the ratio of heights. 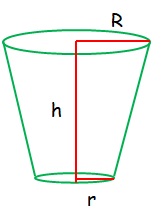 Let "h1" and "h2" be the heights of 1st and 2nd cone. 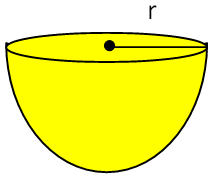 If the ratio of radii of two spheres is 4 : 7, find the ratio of their volumes. 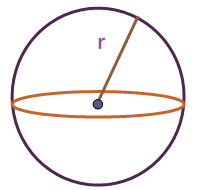 A solid sphere and a solid hemisphere have equal total surface area. Prove that the ratio of their volume is 3 √3 : 4 . 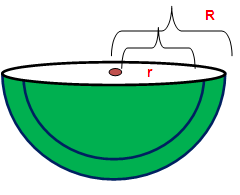 The outer and the inner surface areas of a spherical copper shell are 576π cm2 and 324π cm2 respectively. 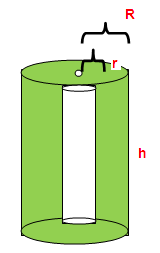 Find the volume of the material required to make the shell. 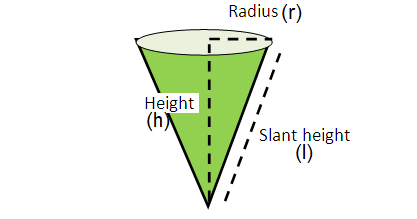 A container open at the top is in the form of a frustum of a cone of height 16 cm with radii of its lower and upper ends are 8 cm and 20 cm respectively. Find the cost of milk which can completely fill a container at the rate of ₹40 per litre. After having gone through the stuff given above, we hope that the students would have understood, "Volume of 3D Shapes Questions with Answers". Apart from the stuff given in this section "Volume of 3D Shapes Questions with Answers" if you need any other stuff in math, please use our google custom search here.